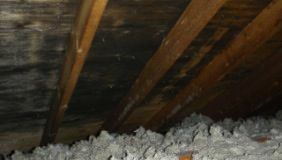 Installing proper ventilation in your attic is the most vital step you can take to increase the longevity of your roof. Poor ventilation will vastly shorten the life of roofing materials. Daily, we see roof systems expire early due to either inadequate ventilation or no ventilation at all. Proper attic ventilation will not only extend the life of a roof but it will help reduce problems as it helps balance, or minimize the temperature differential between the air in the attic and the air outside. 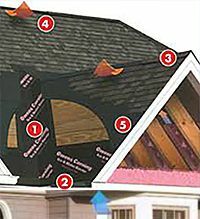 Simply stated; proper roof ventilation removes damaging heat and moisture from attic areas. It is key to an energy efficient, healthy home. While your home needs to be sealed tightly to reduce heating and cooling costs, it also needs to have adequate airflow, to prevent moisture accumulation and provide adequate fresh air within your home. Contact J. Carnes & Son to discover how we can help. If your roof is not that old and you are simply looking to upgrade your attic ventilation we can help that too. Just fill out the contact form or give us a call at any time at any of the numbers listed above and we’ll come out and give you a free evaluation of your current ventilation system. 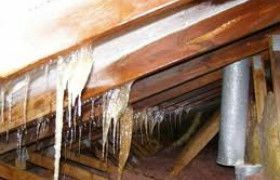 In the summer heat buildup in the attic can lead to the transfer of heat back into the home. When heat transfers back into the home in the summertime it will raise energy costs by putting a load on the AC unit reducing energy efficiency. Heat buildup also encourages premature aging and cracking of roofing materials. 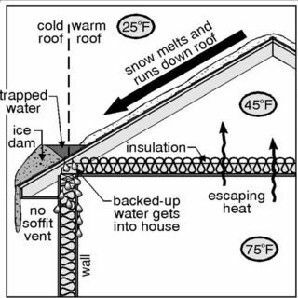 Ice dams occur when the heat from your home gets trapped in the attic consequently warming the roofs decking causing the snow to start melting from the bottom. Since heat rises, this melting will generally start at the ridge of the roof causing water to run down to the gutters and eaves. Once the water hits a cold gutter and eaves it refreezes. The ice eventually backs up under the roofing system or behind a fascia board where it melts again, ultimately soaking your walls and ceiling while destroying everything in its path. While in some cases the combination of soffit vents and continuous ridge vents may be adequate, many times additional venting is needed. There is a variety of attic fan options that you can consider that will help draw air out of your attic space. Some are controlled by a switch or thermostat that can detect heat build-up. Many solar-powered vents qualify for a 30% federal tax credit. To ensure maximum performance of your new roof system, every roof that we sell includes the installation of either roof vents, ridge vents or combination of both. J. Carnes & Son Roofing is a proud installer of GAF Cobra brand and Master Flow roof ventilation systems. There are many options for the intake of a roof ventilation system. We offer the installation of soffit vents, vented drip edge or GAF FasciaFlow premium intake ventilation. During your free estimate we will evaluate your roofs framing and let you know which option will work best with your home. Inadequate ventilation will cause you problems and cost you money! Boards are rotting due to lack of ventilation. Mold buildup due to lack of ventilation. 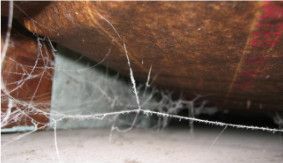 Inadequate ventilation causes buildup of moisture with temperature changes.